To my knowledge, no other writer has better described Chicago than Daniel Pinkwater, who wrote about a thinly-disguised version of Chicago in The Snarkout Boys and the Avocado of Death, The Education of Robert Nifkin, and Lizard Music, which is now available ina gorgeous new hardcover. 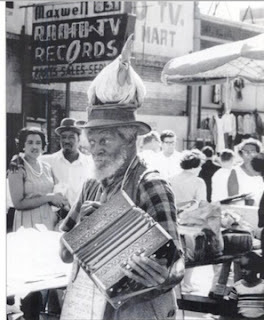 In honor of that long-overdue reissue, here’s a shot by Jack davis of The Chicken Man doing his thing on Maxwell Street. The Chicken Man appears as a character in several of Pinkwater’s books. We’ve previous featured a video of the chicken man and a great shot of him on the bus . This guy may not have come to Chicago until he was about 40, but he was truly a Chicago original. He was still performing around town on his 100th birthday. – The Clark Theatre. Hark, Hark, the Clark! Originally standing where the alley is now on the west side of Clark, just below Washington, The Clark, which was open 23 hours per day and showed a different double-feature nightly, served as The Snark Theatre in The Snarkout Boys series. We should really have entries about all of these things amidst the blood, guts, and gore around here soon! Lol! Daniel was referring to the high school kids in the 50s, when he was there. But I have seen some yearbooks from the 70s that are full of references to smoking pot, etc, which I don't think normally made it into yearbooks, but it's a general rule of mine as a historian that you should never doubt a wild story about kids if it takes place in the 1970s. scdrRegIt's terrific to see the Chicken Man again!